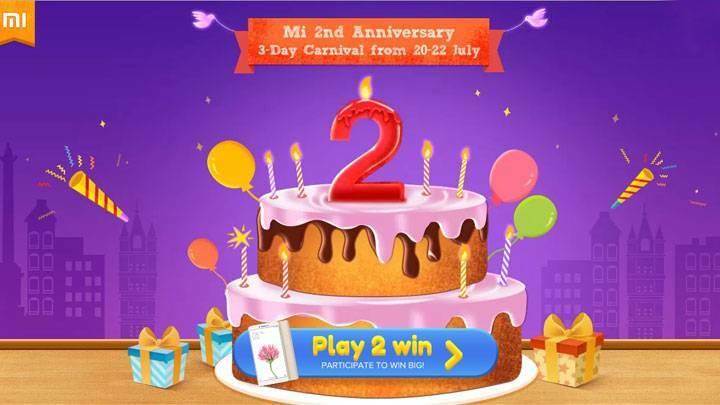 Xiaomi India is celebrating its 2nd anniversary in India. Xiaomi India is hosting a sale on its website mi.com and on Flipkart to offer deals and discounts on the purchase of its few selected devices. This includes Rs 1 flash sales, price drops, special offers and non-stop deals between July 20-22. Xiaomi is offering a discount of Rs 2,000 on its Mi 5 smartphone, which is now available at Rs 22,999. Mi 4 gets a discount of Rs 4,000; which now costs Rs 10,999. The smartphone is originally price at Rs 14,999. Mi Bluetooth speaker now costs Rs 500 and can be bought at Rs 1,999. Besides, the company is also giving out Mi cash coupons, and a free Mi Max for playing a game (Pair 2 Win) on the company’s 2nd Anniversary sale. The game is only available on Mi Store App. Be the first to comment on "Smartphones Xiaomi Mi4, Mi5 get Price Cuts for Mi 2nd anniversary sale"